First American paperback printing, no numberline. Front cover gives the printing date as October 2012, the copyright page gives the printing date as Fall 2012, and the publisher's website lists a 2012 date. Amazon states that the printing date is March 19, 2013, as of 2013-02-25, however this book was bought by the verifier in the month of February of 2013. Front and back covers parody the humor magazine Mad Magazine. Copyright page is to be found on this book's last page. 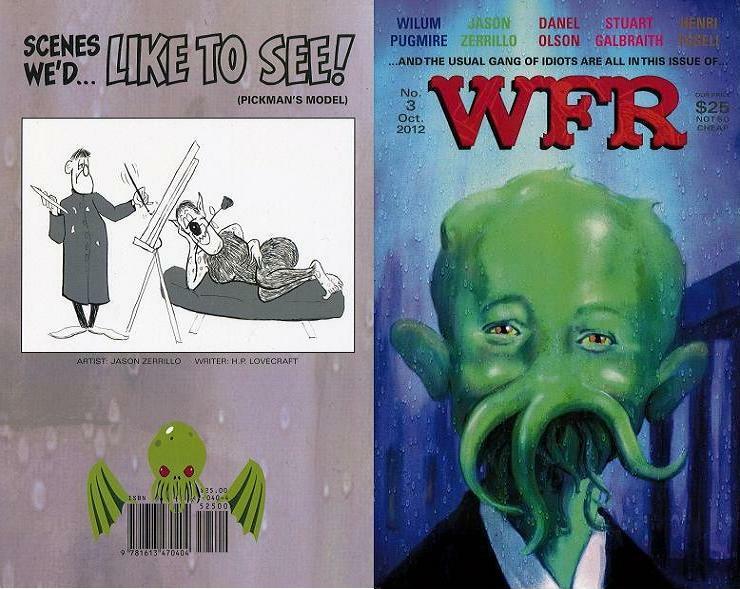 This bookzine is title WFR on the book's front cover and contents page. Spine and copyright page list this as The Weird Fiction Review. Jason Zerrillo's gallery/portfolio is unpaginated, it is however part of the official page count. "Frankenstein Brothers: A Look at War of the Gargantuas" is listed on the contents page as starting on page 167, but the article actually starts on page 166 with a movie poster from the movie. "Excellence Demanded, Whiners Piss Off The Last Interview of Karl Edward Wagner" should be "Excellence Demanded, Whiners Piss Off: The Last Interview of Karl Edward Wagner" but it isn't. Danel Olson's column is called "Horror and Gothic Novels: The Year in Review" on the contents page. John Pelan's column is called "Forgotten Masters of the Weird Tale #2" on the contents page. No Canadian price is listed. 105 • In ... and Out • short story by Joseph S. Pulver, Sr.